How many Facebook fans do we have? What content are we going to post today on Facebook? Do we have a campaign plan for our social channels? How many followers do we have on our company’s Twitter handle? Is our content strategy generating enough engagement? These are questions every marketing team in every organization would be asking themselves. Every brand today, whether B2B or B2C, is adding social media to its online presence to reach out to its customers who are far and away on the web. Three-fourths of marketers planned to increase strategic efforts on social media and social networking sites this year, with 68% also focusing more on SEO and 63% on blogs. Staggering statistics, wouldn’t you say? 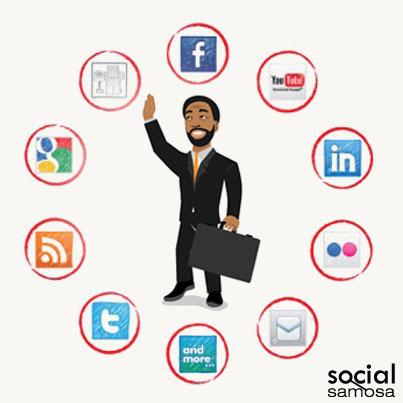 Social media marketing is on every marketers mind as they want to see how they can grow their fan base on each of these channels by spending countless hours to achieve success and trying to decode the secret formula for social media awesomeness. 93% of marketers use social media for business while 21% of marketers say that social media has become very important to their company over the past six months. Today every business has realized that social business practices are vital to achieve success in online marketing, because the world has gone social. 27% of total U.S. internet time is spent on social networking sites while 15% of total U.S. mobile internet time is spent on social networking sites. Social media is constantly evolving—as are social business practices; business entities and marketers need to be committed to ongoing social learning in order to stay in the game. We can agree that we all use social media as a way to familiarize ourselves with brands and products. Approximately 46% of online users count on social media when making a purchase decision. High-quality, original, audience engaging content is rewarded with a social media spotlight, which increases exposure and accelerates lead generation and conversion. 23% of marketers are investing in blogging and social media this year, which shows a 9% increase from 2012. Social media produces almost double the marketing leads of trade shows, telemarketing, direct mail, or PPC and social media lead conversion rates are 13% higher than the average lead conversion rate. A wide variety of content types are used, including social media posts, blog content, webinars, infographics and premium content such as whitepapers and eBooks, as social engagement which is critical. Brands today post content which is barely appreciated by the fans of their pages, leading to very low engagement rates on their content marketing efforts. Marketers worldwide are looking for that one successful formula which would bring them success in a short span of time. They are still looking for it! Understanding the social sphere better! Social Media Marketing can be broken down into three main categories- social content creation, strategic content curation and authentic social engagement. As a marketer, while you plan on investing in social media better, there are a few questions you need to ask yourself. How much business are such social media efforts generating for me? If it is obligatory to engage socially, then, where do I draw the line? Is it fine to pay now (in terms of salaries) for something that will generate benefit sometime in the near future? Is it really where my best minds should be investing time? Even if you consider just four of the most important platforms (Facebook, Twitter, LinkedIn and Pinterest), keeping followers engaged is a gigantic task. All four of them are different and require different efforts from planning and the point of view of execution. We all have a fair understanding of Twitter and Facebook, but running a campaign or managing brand profiles is a completely different ball game. An extremely unique set of skills and insights are required to find and curate something relevant to your brand that people will find share-worthy. If you exclude campaigns with freebies and discounts involved, a return from social media profiles are rarely visible in the short term. A lead or two will come through social profiles from time to time but nothing that would be worth jumping around in glee. Whether it is a tweet, a LinkedIn status update, a Facebook post or a blog post, attention to key details and quality are paramount. Social media success happens only when excellent, original, engaging content is created. Your content strategy would define whether your fans will be interested in your page or not. Make sure you test different types of content on your page and derive insights out of them to determine what type of content works for you .One size doesn’t fit all here, so you have to make sure that if you want to build a loyal fan base on your social channels, you need to understand what your fans like. Your fans would want a reason to come back to your page for more- make it compelling for them. Engage them with quizzes, contests, reward them, and feature them on your brand page. Make them feel special every single time they visit your social channels. Generating different pieces of content for each channel may be a daunting task, and let’s admit we cannot wear our creative hat all the time to come up with path breaking ideas. So when you generate a piece of content for a particular channel, you can use the same piece of content with a variant on another channel which is tailor made for that channel. This is extremely important as your fans would love to see your content adapted according to each channel differently. Social media is a wave every brand is riding today with each brand figuring out what works for them and their respective fans. There is no set formula for social media success unless we test the waters and understand what your customers want, which can only be achieved by listening to them. This would help build strong brands where your customers would vouch for you, be loyal to you and recommend your brand to their peers. How to Plan for a Successful Contest on Twitter?